Machine Capacity: As Per Req. Working Table Size (m): 24"
We offer to our clients superior quality Wiro Punching Machine. Due to high quality and durability these Punching Machines are famous among its user. These Wiro Punching Machine are available in market at most economical rates. Our products are highly appreciated by our clients in the market. 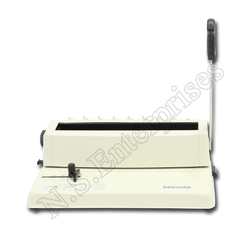 KAMAL Wire O Punching Machine, Deluxe model. By employing progressive techniques and premium quality raw materials, the provided range of Wiro Punching Machine is manufactured in tandem with industrial norms. The range of EX LHERMITE automatic punching machines is designed to accommodate the widest possible punching and shape applications on loose leaves, simply, efficiently and at very high output speeds. - The sheets are fed via lightweight aluminum trays, which rise automatically. - The paper can be loaded continuously without stopping the machine. We are engaged in offering Wiro Punching Machine. In order to meet excellent quality standards, we are supplying Wiro Punching Machine.